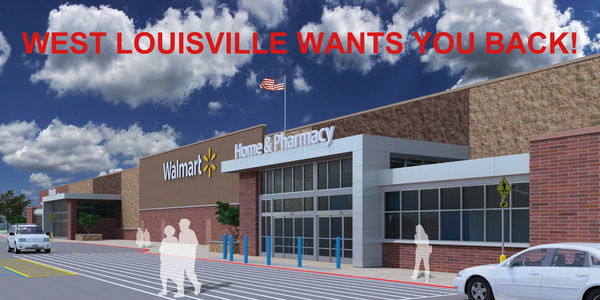 WAL-MART: WEST LOUISVILLE WANTS YOU BACK! WAL-MART, West Louisville wants you BACK! West Louisville has over 60,000 residents, who need convenient, affordable options for shopping. West Louisville residents need employment opportunities. And, West Louisville residents pledge their support for the Wal-Mart Superstore #6391 at West Broadway and 18th Street. Wal-Mart's decision to cancel plans for the new supercenter leaves residents in West Louisville without access to affordable goods and services that many other communities take for granted. West Louisville’s residents already experience barriers to accessing healthy food, and so many were anxiously awaiting the opening of a Walmart Supercenter in their community. West Louisville residents who pledge their full support for the new Wal-Mart Supercenter, respectfully ask that Wal-Mart reconsider their decision to cancel building the facility at 18th and Broadway. Nearly 5000 signatures in support of Wal-Mart at 18th and Broadway were collected in less than three weeks. Now, help us surpass that number with a goal of 30,000 signatures to show Wal-Mart that we are serious about welcoming them in our community. Please sign this petition to Doug McMillon, President and CEO of Wal-Mart Stores, Inc. and Greg Foran, President and CEO of Wal-Mart U.S. right now. Let's tell them that West Louisville residents want Wal-Mart to build their supercenter at 18th and Broadway to provide the community with access to fresh, affordable food and quality products! WEST LOUISVILLE WELCOMES WAL-MART IN OUR COMMUNITY! West Louisville has over 60,000 residents, who need convenient, affordable options for shopping. West Louisville residents need employment opportunities. Many hearts were broken when plans were cancelled to build the Wal-Mart Supercenter in our community. West Louisville residents pledge their full support for the new Wal-Mart Supercenter and respectfully ask that Wal-Mart to reconsider building the facility at 18th and Broadway. Nearly 5000 signatures in support of Wal-Mart at 18th and Broadway were collected in less than three weeks. With this petition, we want to show Wal-Mart that we are serious about welcoming you in our community. West Louisville residents pledge their support for the Wal-Mart Supercenter #6391 at West Broadway and 18th Street in Louisville Kentucky. With Wal-Mart, we all win! Together, we all did everything we could to convince Walmart that West Louisville welcomed them in our community. Walmart representatives expressed thanks to every supporter for their comments and work to help them during the planning stages of the development. However, at this time, Walmart has cancelled their plan for the West Louisville superstore. I personally say “Thank You” to everyone for your support. Help us obtain our 30,000 signature goal! Please continue to encourage your family, friends and colleagues to sign the petition. Post and share it on your social media pages! Thank you for signing the petition supporting the West Louisville Walmart Superstore at 18th and Broadway! Please ask 30 of your friends, family members and colleagues to join us in asking Walmart to keep their commitment to West Louisville by building the Walmart Superstore at 18th and Broadway. Continue to share the petition link with your family, friends and colleagues. Imagine; if each supporter asks 30 friends to sign the petition, we will reach 30,000 signatures in a matter of days! Remember to wish your neighbors Happy Holidays and encourage them to sign the petition as well. We will present this signed petition to Wal-Mart in early January 2017 to show our support. That's only a few weeks away.